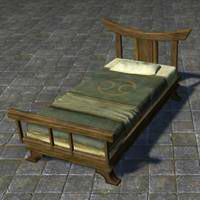 Dark Elf Bed, Single is a fine (blue) quality Furniture in The Elder Scrolls Online. Crafted, Clothing Station. Requires Pattern: Dark Elf Bed, Single. Patterns are found randomly in containers around Tamriel and can be traded and sold by players. Some special Patterns are only available from pickpocketing or as special rewards. House: Ebonheart Chateau, Flaming Nix Deluxe Garret, Kragenhome, Quondam Indorilia.